It's very rare in life that you find a mentor, great friend, and a mommy confidant who happens to be a phenomenal interior designer. 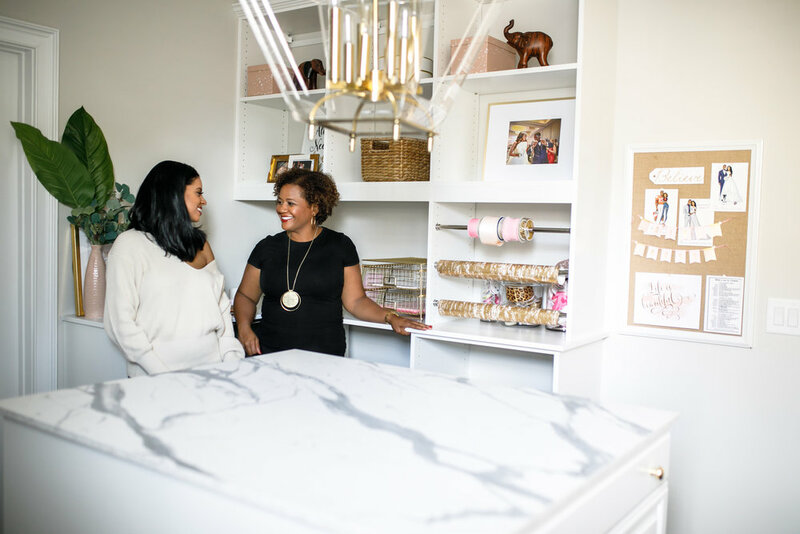 With her creative eye and impeccable attention to detail, Deena Knight of Deena Knight Interiors, not only transformed my home, but her influence has positively extended into my life as a wife, entrepreneur, and as a creative #bossbabe. During one of our monthly chats over coffee, Deena and I were discussing the tremendous growth that the Dominique Sensabaugh Lifestyle Brand has experienced over the past 6 months. I explained to her that although inspiration strikes at any moment and any location, sometimes I wish I had a space to escape the daily demands of life and that was used SOLELY to create. Deena brilliantly recommended that I invest in an office that would cater to my ever evolving personal and professional needs. Not only did she curate an amazing space that provided endless inspiration for the Dominique Sensabaugh Lifestyle brand but it also serves as a safe haven for me to write, daydream, design, unwind, play with Marri, chat with Coty, store my crafts, paint, design cards filled with confetti, and any other artistic task that could be accomplished. This perfectly designed Deena Knight interiors space was the culmination of perfection that was to be my office. In launching DSLB, I knew I would encounter a constant uphill battle: family members and frenemies wishing my demise, people sleeping on my skill sets and abilities solely because I married an athlete, naysayers who doubt my worth or can't see the value in collaborating. It seems like the moment you take the leap of faith to step outside of your comfort zone to explore something new, many things go wrong. However, I never imagined all of the things that could go right! The joy in launching this business comes from meeting amazing influencers and mentors, working with incredible brands and companies that recognize my creative genius and value a partnership, endless opportunities to interview dynamic leaders in their respective industries and reach the masses through sharing unique and inspiring stories. This journey, so far, has been transformative and I have learned as a female entrepreneur, you need to surround yourself with other like-minded women who want to pour into your dreams and see you succeed. Deena, a fellow business owner, and creative entrepreneur believed in me, took me under her wings, and created a space for me to create magic. For that I am forever grateful and I am so excited to share this room transformation with you. The most exciting design elements of this room is the beautiful accent wall. 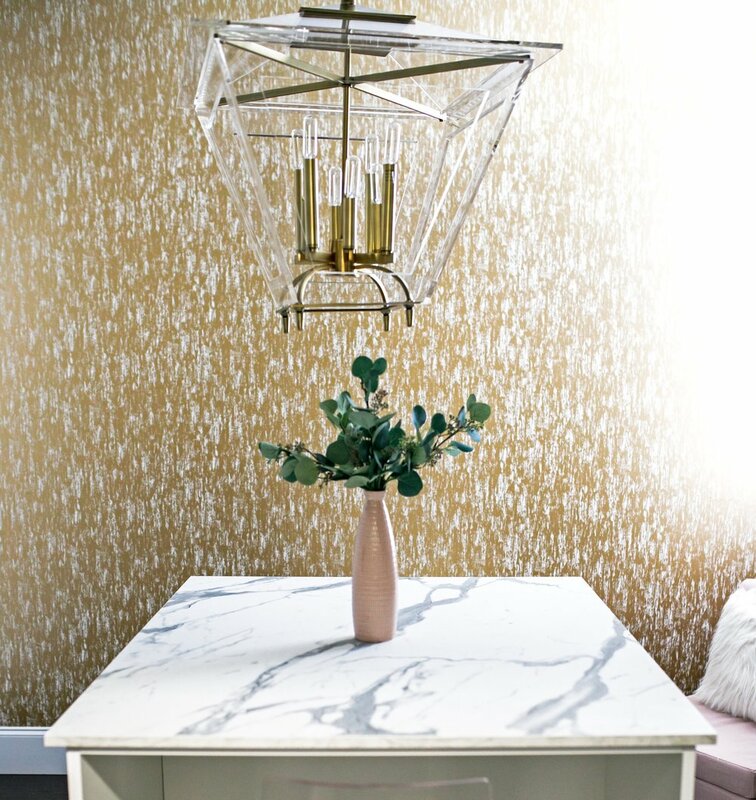 One of the most creative and easiest methods of transforming a space is with unique and beautiful wallpaper. For this task we used Tempaper, known for their innovative products, chic collections and partnerships with prominent designers that share the same vision. Tempaper is dedicated to using state-of-the-art materials that are 100% made in the USA, non toxic, environmentally safe and friendly. Tempaper is perfect for DIY projects including but not limited to: dressers, stair risers, cabinets, bookshelves, drawers and headboards. You can let your imagination be your guide when decorating with Tempaper. Wallpaper is the perfect option when transforming a space and is a cost-effective, durable way to decorate your room. We used the elegant Cynthia Rowley Gold Leaf paper. It was EXTREMELY easy to hang and it instantly created the perfect accent wall in the office. PRESS PLAY BELOW TO WATCH THE TEMPAPER TRANSFORMATION! Who doesn't love a trip to Target? 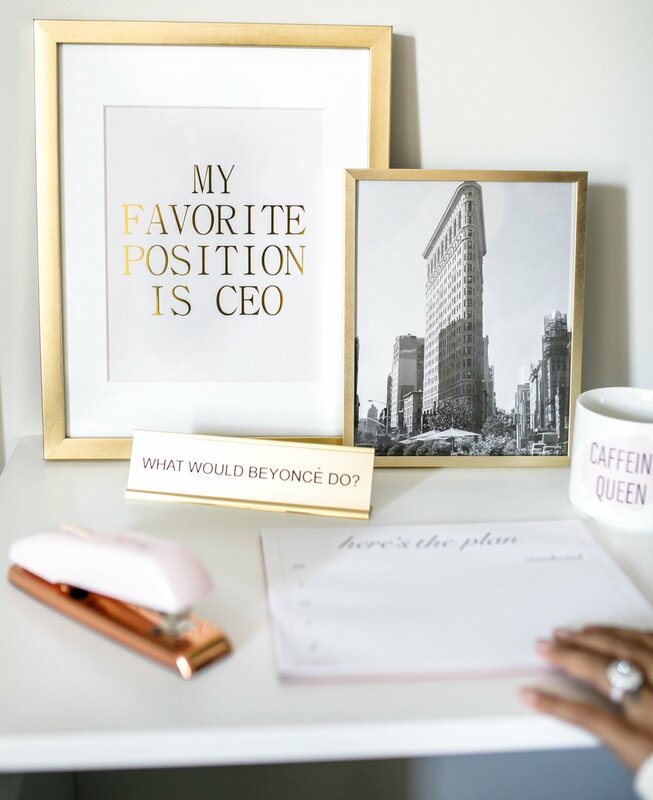 We decided Target was the best place to find cute yet practical office items and decor at affordable prices. With Target’s great selection of decor items to accompany the luxurious Cynthia Rowley tempaper accent wall, the glamourous custom lighting and Deena's design genius, I knew this was a recipe for greatness. PRESS PLAY BELOW TO WATCH DEENA WORK HER SHOPPING MAGIC! 1. A place for everything and everything in its place — you are more likely to stay organized if you have specific places for things. Use glass jars, wicker baskets, paper boxes or metal tins to group like objects. Add a pretty label for extra organization. 2. Make it pretty —it may sounds trite, but having a lovely space just feels more inspiring. 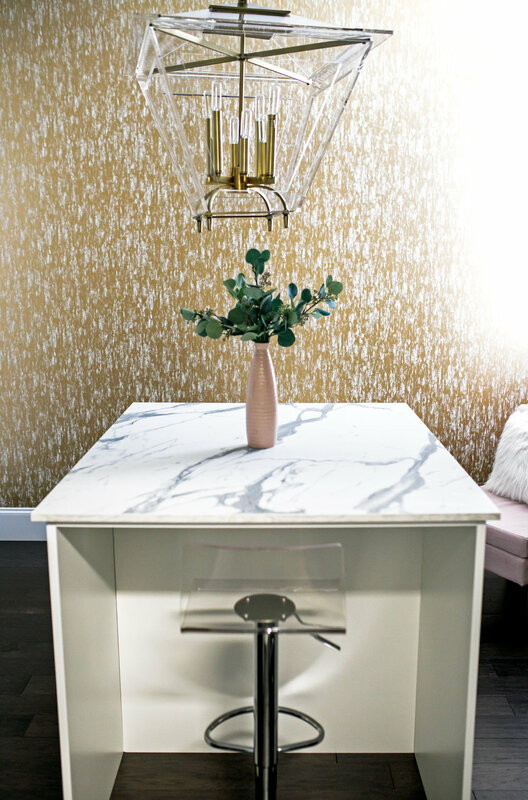 Adding this gold accent wall elevated this room tenfold. Who wouldn’t want to be in here?!? Additionally, decide on a color palette and stick to it when choosing decorative and utilitarian items. This allows the room to feel cohesive. You can even show off pretty little items like ribbon and washi tape in glass jars. But remember the color scheme. For more endless design inspiration visit Tempaper Designs and Deena Knight Interiors!